The market is segmented by Product, End User (Hospitals/Critical Care Settings, Ambulatory Care Settings, Research Laboratories, and Other End Users), and Geography. 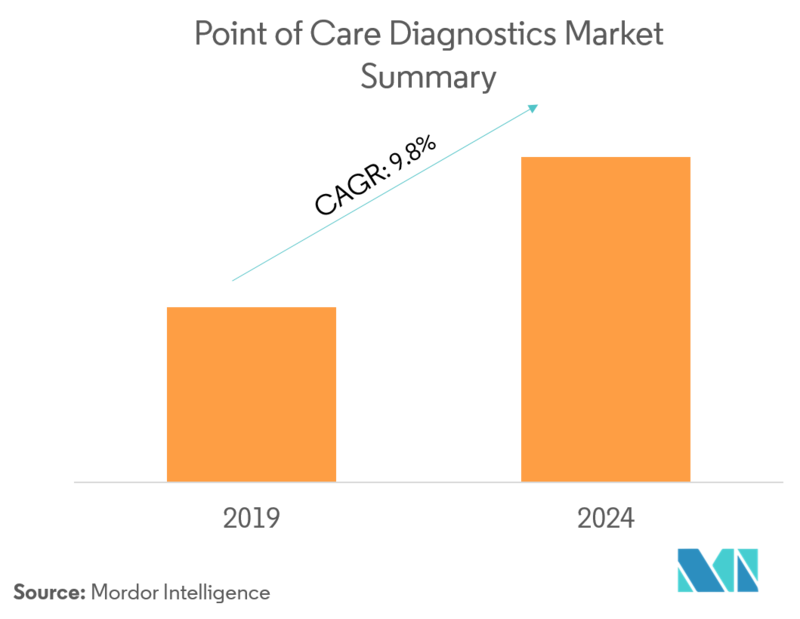 The point-of-care diagnostics market is expected to register a CAGR of 9.8%, over the forecast period. One of the major factors responsible for the growth of the market is the rising prevalence of chronic and infectious diseases in developing economies. The prevalence of chronic diseases, like diabetes, rheumatism, or cancer, is increasing globally, due to various reasons, such as an increase in geriatric population, sedentary lifestyles, unhealthy food habits, and environmental factors. For instance, chronic diseases kill more than 38 million people each year, globally. Cardiovascular diseases account for most chronic disease deaths, or 17.5 million people, annually, followed by cancers (8.2 million), respiratory diseases (4 million), and diabetes (1.5 million). The aforementioned diseases account for 82% of all the chronic disorder deaths. Point-of-care diagnostics is gaining wide acceptance by different patients across the world, as samples are collected from the patient’s location for performing tests, and the results can be achieved in very less time, due to the use of micro fluids, chips, and nano diagnostics. Factors, such as the increasing number of regulatory approvals for novel immunoassay techniques, technological advancements, and the rising usage of home-based POC devices, are expected to drive the market growth, over the forecasted period. Point-of-care testing diagnostics have many advantages, which allows patient diagnoses at many places, such as in the physician’s office, an ambulance, the home, the field, or in the hospital. The results of care are timely and offer rapid treatment to the patient. 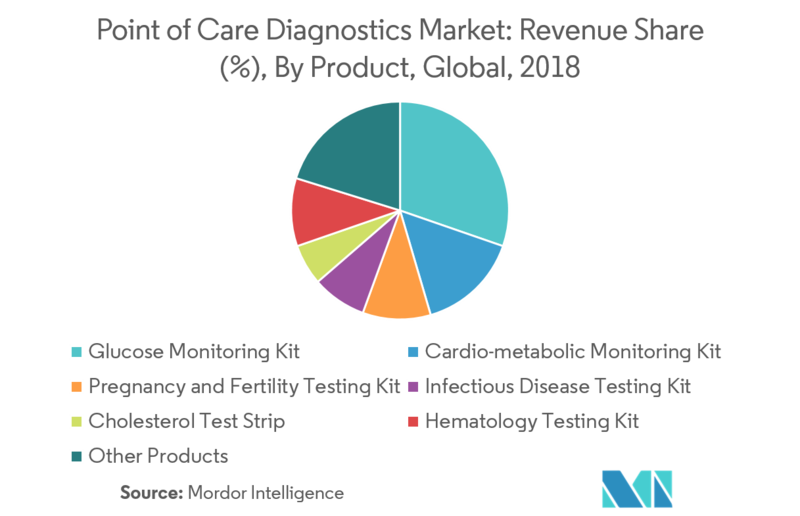 Blood glucose testing point-of-care diagnostics captured the largest share in 2018, due to the success of hand-held glucose meters, owing to their high adoption rate among the population across the world. Periodic monitoring of glucose level is of vital importance for diabetic patients, which has encouraged the adoption of POC among the diabetic patients in this segment. Other advantages associated with hand-held glucose meters are the portability and easy operability. Rising prevalence of diabetes across the world is expected to boost the segment growth in the future. 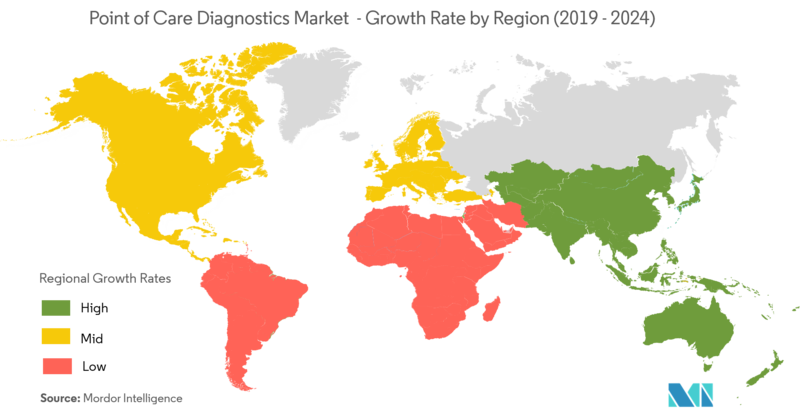 Currently, North America dominates the market for point-of care-diagnostics, and is expected to continue its stronghold for a few more years. In the North America region, the United States holds the largest market share. This can be majorly attributed due to the growing geriatric population base in the country, as well as the factors, such as the increasing prevalence of diseases and the favorable government regulations and initiatives undertaken for the development of healthcare infrastructure. 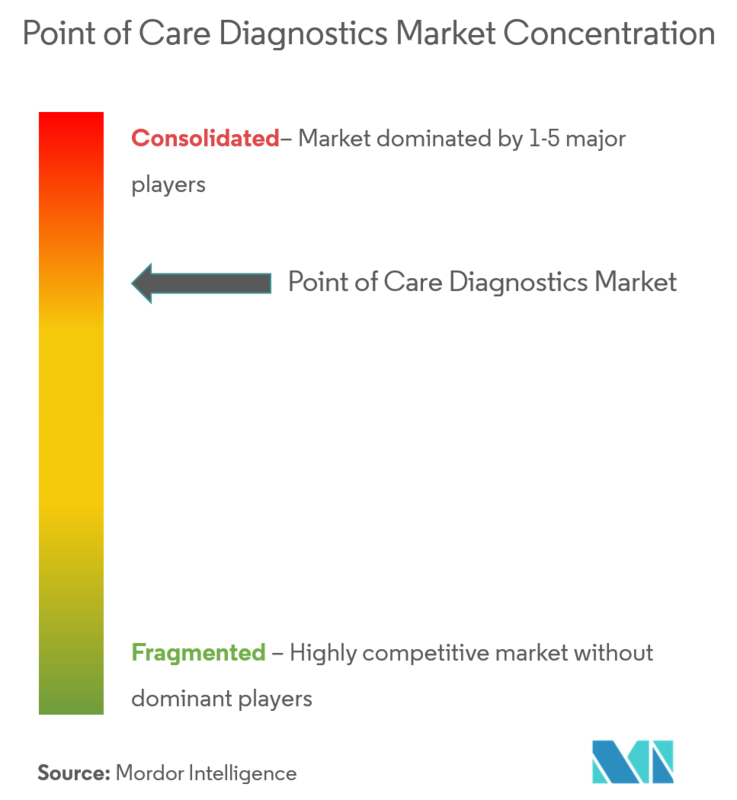 The point-of-care diagnostics market is moderately competitive and consists of several major players. In terms of market share, few of the major players currently dominate the market. With rising prevalnce of diseases and increasing number of aging population, other players are also expcted to enter into the market. Some of the major players of the market are Abbott, Siemens AG, Becton, Dickinson and Company, Johnson and Johnson, and F. Hoffmann-La Roche Ltd, among others.